HMS Invincible was a 74-gun, third-rate ship of the Royal Navy, built in 1765 at the end of The Seven Years’ War. During her career, she served in the American War of Independence at the battles of Cape St Vincent in 1780, the Chesapeake in 1781 and St Kitts in 1782. She was also present at the Glorious First of June in 1794, where she was badly damaged and lost fourteen men, and took part in the invasion of Trinidad in 1797, which captured that island from the Spanish. Thus, by 1801, HMS Invincible was 36-years old with a proud record of service to her name. In March, 1801, the war against France was already entering its eighth year, with nothing much gained by either side. Since Britain’s mighty naval power and France’s near-invincible army could not come directly to grips with one another, much of the action was indirect. Britain subsidised continental countries to undertake military action against France, while France did all it could to damage Britain’s trade and hurt its wealth. The current fear in London was that the French would seize the the powerful Danish navy and use it against Britain. The Baltic fleet, led by Admiral Sir Hyde Parker with Nelson as his second-in-command, was therefore directed to sail to Copenhagen and make sure the Danish fleet could not fall into French hands. HMS Invincible was to be part of this fleet. She sailed from Chatham with a crew of around 600 and put into Yarmouth to collect final orders and stock up with ordnance, stores and ammunition. 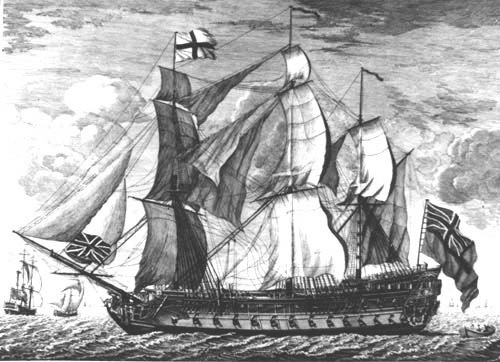 On March 16th, 1801, she finally left Yarmouth Roads to join the fleet, having on board Thomas Totty, Rear Admiral of the Blue, and John Rennie as her Captain. The ship’s course from Yarmouth took her through a notorious area of shifting sandbars off Happisburgh on the north-east coast of Norfolk. Master and pilot clearly thought they could navigate through the shoals safely, but a rising wind and the strong tide forced the ship off course. At around 2:30 in the afternoon, HMS Invincible struck the sandbank called Hammond’s Knoll, part of the complex, treacherous Happisburgh Sands. The crew did all they could to save the ship. They jettisoned provisions and cut away the masts, hoping that she would float off the sands at high water. For a while, it looked as if this would work, but the ship quickly grounded again. The future looked very bleak. All the crew could do was man the pumps and try to keep as much of the ship as possible above water, then pray for rescue. Rescue might indeed have been expected, since the wreck took place only a few miles offshore, and the frequent firing of the guns as a distress signal must have been audible over a wide area. Everyone’s spirits rose as a revenue cutter, the Hunter, on her way into Yarmouth, answered the distress signal. Yet still no help came. Only the Nancy, a small fishing smack looking for cod, came to the aid of the stricken Invincible. The Nancy’s captain, David Grigson, anchored his ship nearby and offered what assistance he could. By midnight, it was clear that nothing more could be done to save the Invincible. The Nancy took on board Admiral Totty and the very youngest of the members of the Invincible’s crew. The Invincible launched her own boats safely, full of men. Yet even now, the sea would not give up its prize. All the boats bar one launch were swept further out to sea. Still the Nancy waited, hoping to be able to rescue more of the crew when daylight returned. But as dawn came, the final act of this tragedy arrived. The Invincible suddenly went down. Some remaining members of the crew jumped for the ship’s launch, quickly rendering it overloaded. Captain Rennie, the last to leave the ship, also attempted to swim to the launch. It was too late. When he was almost within reach, he was overcome with cold and exhaustion. Those on the launch saw him lift his hands to the sky, place them over his face and sink calmly beneath the water. At daylight on Tuesday morning, I observed that the Invincible had not a single Boat, either alongside or astern of her, and the tide ran so strong that it was impossible to get the fishing Smack to her, but the moment the tide slacked … she stretched under the Invincible’s stern, endeavouring by all possible means to work up and get alongside of her; but before that could be accomplished the Ship went down in thirteen fathoms Water, and out of 600 persons that belonged to the Invincible they have not been above 190 saved and now living; several who were picked up by the launch died very soon afterwards. I am extremely grieved to inform you that Captain Rennie was among the number of those drowned; by his death the service has lost a truly zealous and intelligent Officer … The horror of the scene at the Moment the Ship went down far exceeds all power of description. Amongst those who had reached the Nancy or the collier and were landed at Great Yarmouth still more died, probably through exposure to the bitterly cold water of the North Sea. In total, more than 400 were lost, compared to the 256 who died at the Battle of Copenhagen. On his way home from his triumph, Nelson still made time time to visit the men from the Invincible lying injured in Yarmouth hospital. For days after the wreck, bodies were washed up all along the coast. Most were brought on carts to Happisburgh churchyard, where they were buried in a huge, unmarked communal grave in unconsecrated ground to the north of the church. Of all those lost, only six received a proper burial in Winterton churchyard. The only lighter element in this story concerns the many casks that were seen floating on the sea after the wreck. Someone 150 were brought ashore by the customs officers and found to contain brandy. Others escaped to be picked up by delighted villagers; so delighted that many drank themselves into oblivion and one even died from his excesses. At the Court-martial, it was found that the ship was lost through the ignorance of the two pilots (both of whom were drowned). The conduct of all others on board, from the Admiral down to the youngest cabin boy, was described as ‘highly meritorious’. That is not quite the end of the story of the Invincible. An attempt to erect a memorial by subscription in the early part of the 20th century failed. Later, the land where the dead were buried was incorporated into the churchyard. Then, in 1988, a trench was dug through the mound that stood there as part of work to improve drainage, and a disordered mass of bones was found less than three feet below the surface. The remains were reburied with proper rites. Ten years later, a simple stone tablet was placed on the site and stands there today, a final recognition of all those who died on HMS Invincible 214 years ago. If you found this article interesting, why not give it a tweet? This entry was posted in C18th Norfolk, Military. Bookmark the permalink.